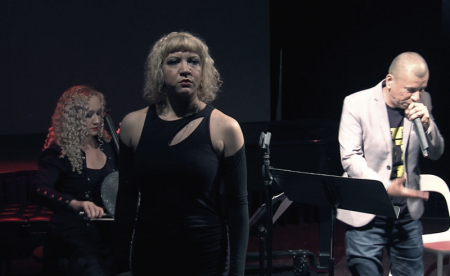 The Rap/Opera Project Ensemble presents a revolutionary model for the classical performing arts. The piece utilizes youth voices during workshop sessions prior to the performance. Helmed by Hector Armienta, R/OPE features a quartet of out-of-the box performers including master beatboxer/rapper Emcee Infinite, acclaimed soprano Alexandra Sessler, and cellist and composer Cellista. R/OPE fuses the storytelling power of opera and rap into a powerful platform, drawing on the on the narratives of at-risk youth and reimagining the art form of opera to encompass one of the primary social musical languages of today - rap. The project furthers and supports the mission of Opera Cultura by exploring the the cultural experiences of the community through music theater and opera, while providing opportunities for the community to participate as creators, learners, and performers. R/OPE’s intention is to offer a new platform for storytelling to not only be told, but heard. By merging the voices of the community into an inclusive setting, R/OP offers a chance for marginalized voices to be validated. Performance Through the act of performance, the narratives of the youth are validated. Armienta, Aguirre, Sessler, and Cellista work together as a team following the workshops to create a collaborative work that incorporates youth voices into a performance which merges elements of opera, hip hop and theater.